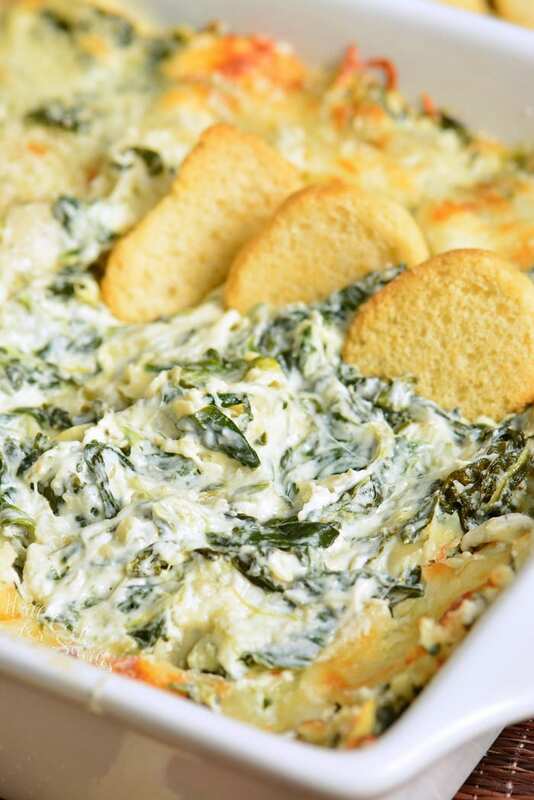 Spinach Artichoke dip is a classic appetizer that everyone should have it in their cooking repertoire. 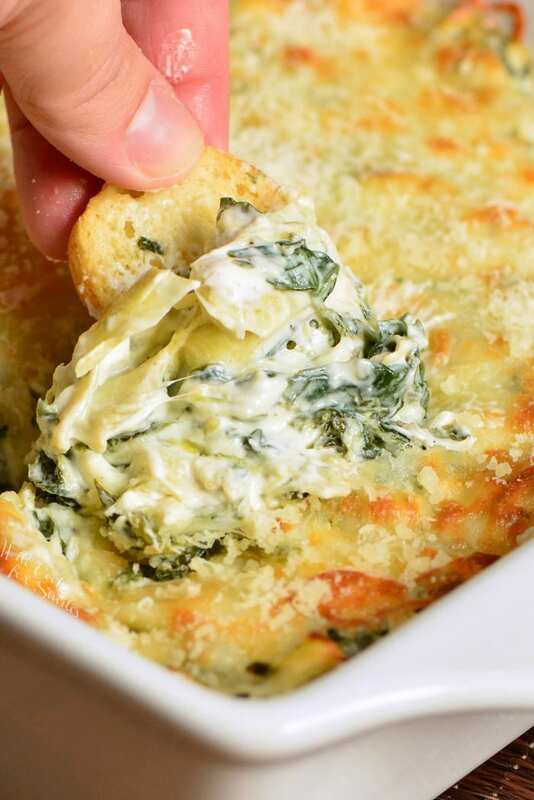 Creamy, cheesy dip made with spinach, artichoke hearts, cream cheese, Mozzarella cheese, Parmesan cheese, and a few other flavorful ingredients. 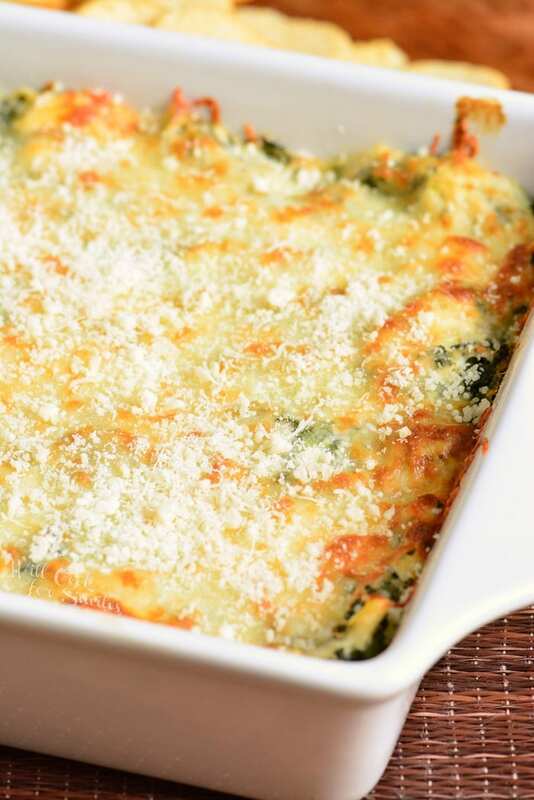 Every step of this recipe is worth it to get the best Spinach Artichoke Dip possible. 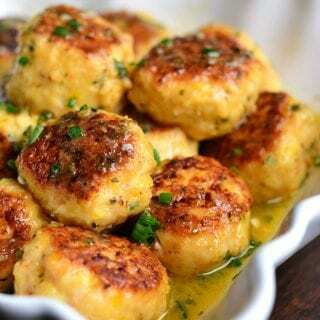 There are many party appetizers that your guests will go crazy for. Don’t forget to make extra Buffalo Chicken Dip, Fontina Mushroom Artichoke Dip, and Hot Crab Dip. You party will be a success with an array of the best dips. Ever since the very first time I tried Spinach Artichoke Dip at a restaurant, I fell in love with it. That was also the first time I tried artichoke and realized what I was missing in my like. Not just the artichoke, but the whole cheesy, creamy combo. 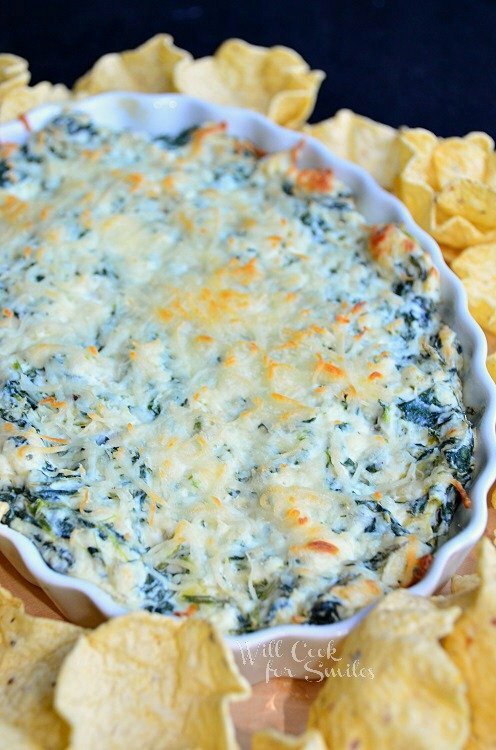 Spinach Artichoke dip is so easy to put together, it’s fast to make and always delicious. It’s been a huge hit at every party I’ve ever served it. Everyone has their own special way of preparing this dip and I love to make it in the oven until bubbly with cheese on top. I also like to throw it lots of Italian flavors. I think it’s so much better served how, when cheeses get a chance to melt and get gooey. There are lots of great options to serve with this dip as well. Tortilla chips is a very popular chip for this dip but I love it with fresh veggies too. It tastes awesome with some fresh cucumber slices. 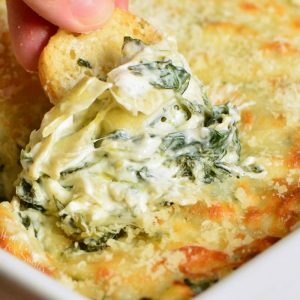 To make this Spinach Artichoke Dip recipe in the Crock Pot, you would simply need to substitute a Crock Pot for the oven. Prepare the dip up the the step of spreading the dip mixture in the baking dish. Spread prepared dip mixture in a Crock Pot and close the lid. 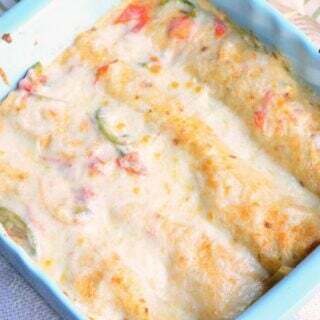 Stir if needed, spread 1 cup of Mozzarella cheese and 1/4 cup of grated Parmesan cheese over the dip. Close the lid and cook for another 30 minutes. Great thing about making this dip in a Crock Pot is that you can serve it right in it and keep the setting on warm. The dip will stay warm all through the party. The question I most often get about this dip is which spinach to use, fresh spinach or frozen spinach. To be honest, I’ve used both on numerous occasions and it doesn’t make that much difference when it comes to flavor. Frozen spinach is easier to use because you don’t have to wilt fresh spinach first by cooking it. 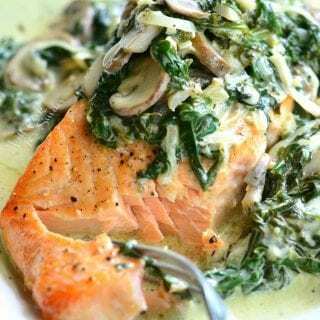 But, whether you use fresh spinach or frozen spinach, make sure to squeeze the excess juices from both. This dip is the best with some Italian flavor so Italian cheeses taste the best in this dip. Try Mozzarella, Italian Cheese mix, Parmesan, Asiago, and may be a little more Parmesan. I also found that adding just a couple of tablespoons of fresh minced parsley will enhance the flavors greatly. This dip is easily prepare ahead of time. Simply prepare the dip according to the recipe but instead of baking it, cover with saran wrap and refrigerate until ready to bake. I would recommend making it a day ahead at the most. 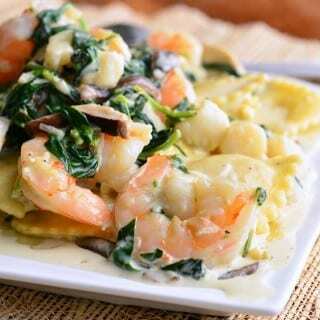 Squeeze out excess juices from spinach and artichoke hearts. In a mixing bowl, combine cream cheese, Mozzarella cheese, Parmesan cheese, pressed garlic, sour cream, mayo, parsley, salt and pepper. Mix very well until all incorporated. Mix in the spinach and chopped artichoke hearts. Transfer into a baking dish. Top off with a cup of shredded Mozzarella cheese and grated Parmesan. Serve tortilla chips, bread crisps, and/or veggies. Originally published on Will Cook For Smiles on May 5, 2011. Another great recipe, I love this dip. OOOH YUMMM!!!!! Thank you sooo much for visiting my blog!!!! I want to apologize for not getting here to visit you sooner. Im sooooo excited to be your new follower, I need all the cooking inspiration I can get!! Im an awful cook!!! LOL!! I bought one of those california brand pizzas today and it had this dip in it!! First time I have ever had it and it was great! So excited that you posted this recipe, I was so gonna try and find one for it and voila…here it is!! Mmmm, this dip looks delicious! 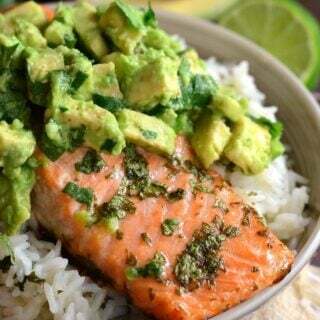 I’m a new follower to your blog, I am really enjoying all of your recipes. 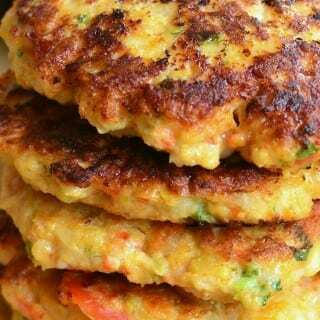 Thank you so much for posting the receipe. Really, I mean it. 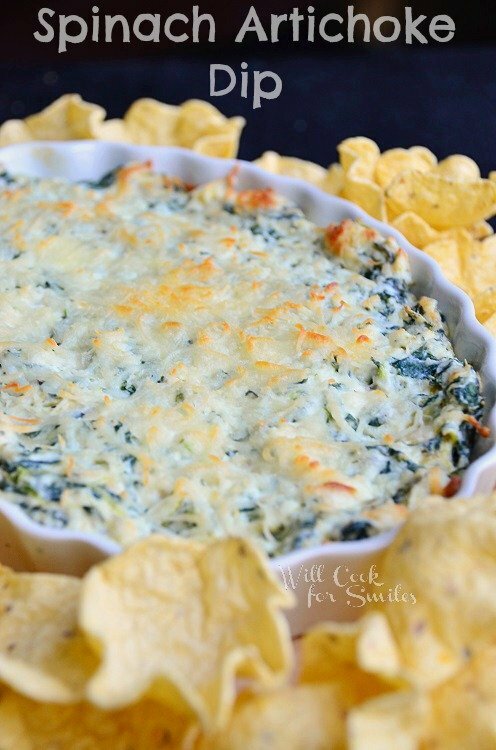 My kids love Spinach Artichoke Dip. I usually pay too much for it at restaurants. I’ve never made it myself before. I’m going to print your post so I can make it this weekend. yeah!!! 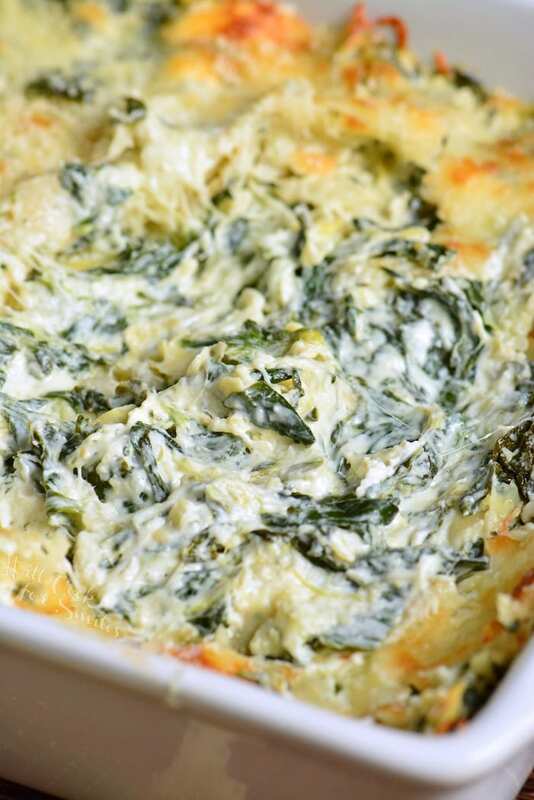 This looks like a perfect Spinach Artichoke Dip, Lyuba! I love this dip. Can it be made ahead and frozen? The recipe is a bit too large for just my husband and myself. You know, it’s hard to freeze creamy sauces or dips because it trends to separate as it defrosts. You can try cutting the recipe in half or save leftovers in the fridge and just reheat the next day. It will keep in the fridge for a few days. I like to reheat these types of dips in the oven but use a microwave as well.